In a Nutshell: Despite a spike in e-commerce, the brick-and-mortar experience is still preferred by many customers. So keeping store associates engaged is a top priority to ensure a delightful in-store experience. Kronos offers a complete workforce management platform that helps reduce the friction between employee and employer, fostering loyalty and improving performance. By using Kronos, a business can schedule and track payroll more efficiently. 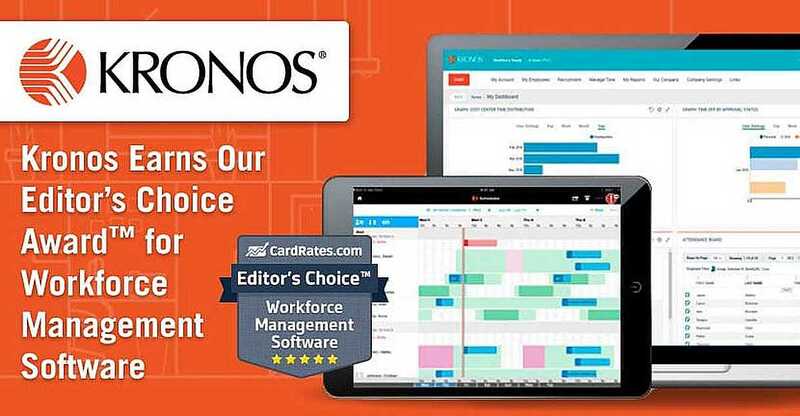 For its robust platform that helps eliminate barriers between employee engagement and production, Kronos has earned our Editor’s Choice Award for Workforce Management Software. Although e-commerce growth shows no signs of slowing, customers still love the brick-and-mortar experience. As Entrepreneur Magazine reports, the segment of consumers making in-store purchases, including for such things as groceries (92%), packaged goods (77%), and apparel (76%), is still staggering. Even 64% of Generation Z — the next era of tech-savvy shoppers — prefer shopping in-store to online. The data suggests store associates are still a brand’s most important ambassadors, meaning managing a workforce efficiently and keeping employees engaged is vital. Kronos knows that — particularly in the world of hourly employees — friction points can arise from the way a business handles everything from day-to-day employee scheduling to benefits enrollment. Over time, that friction can add up to disengaged employees, higher turnover, and revenue losses. And the number of disinterested workers is startling, as a study from Dale Carnegie Training found that 71% of all employees are not engaged. Through its Workforce Central Suite platform, Kronos works to eliminate barriers to engagement that pop up on both the management and employee side. The company does this by introducing something coveted by both groups: consistency. Jennifer Johnson, Head of Retail and Hospitality Practice Group at Kronos, talked with us about her company’s platform. Kronos also makes it easy for both employees and employers to access its tools — whether through a mobile device, browser, or an in-store terminal. A popular platform for retailers, Kronos serves over 50% of retail and hospitality businesses in the US, which is double the market share of its closest competitor. Because of its commitment to boosting employee engagement, reducing friction points, and helping retailers become more efficient, Kronos has earned our Editor’s Choice Award for Workforce Management Software. With the Workforce Central Suite, a retailer can quickly take control of timekeeping and scheduling, both of which contribute to inefficiency and are among the biggest dissatisfiers for employees. Accurate timekeeping alone can boost morale. No employee likes to be shorted on a paycheck because of a discrepancy or mistake caused by an elaborate attendance system. Scheduling accuracy and equitability are other points of contention between employee and employer, and Kronos’ robust scheduling tools can help ease those tensions by creating efficient and equitable schedules based on the current workforce. “Retailers can’t control inventory cost or the price of particular products, but they can control how much they are paying for labor, how much people work, overtime distribution, and how many associates they have scheduled, which is a huge piece of the pie,” Jennifer said. Companies can even generate schedules based on projected store traffic patterns from previous data. Kronos does this with the aim of eliminating the problems of overstaffing and understaffing, which can mean a company loses money on wages (overstaffing) or possibly creates a disappointing customer experience (understaffing). But timekeeping and scheduling are just two important parts of the Workforce Central Suite. The platform contains a host of other features meant to enhance efficiency on both sides. The software gives employees more control by allowing them to keep track of their hours and request time off. For management, it provides payroll capabilities and tools for dealing with absences. The suite also has labor-law compliance built in, alerting employers to any violations if they are scheduled to occur. Workforce Central also runs in a browser as an HTML application, meaning minimal IT resources need to be devoted to installation and maintenance since the suite updates via the cloud and is always on the current version. Kronos’ end goal is to make often laborious processes like time-tracking, scheduling, and payroll seamless and intuitive, because eliminating dissatisfiers often leads to more engaged employees and better customer service. It should come as no surprise that happy employees work harder and are more invested than their unhappy counterparts. But what may be surprising are some of the areas that can cause employees to become disengaged. Lack of break time, working an opening shift immediately after a closing shift, and unfair overtime distribution can all be contributing factors to an employee’s dissatisfaction. These are major problems that Kronos aims to solve through its platform because as Jennifer told us, employee satisfaction can have a ripple effect that ends up infringing on a company’s bottom line. Kronos looks to the lighter side of employee engagement and productivity in its Time Well Spent cartoon series. Often, in-store associates offer the consumer an introduction to the company, and that first impression is critical to forging an ongoing relationship. Kronos also advises that a company have a continuous employee feedback loop to replace once-a-year employee engagement surveys. Through year-round surveys, employees can help employers understand issues that may arise over a longer period of time, but are forgotten or irrelevant by the time a yearly review comes around. Companies that eliminate hassles for employees — like erratic scheduling — can see those efforts pay dividends quickly. And with Kronos’ analytics and reporting tools, retailers can see what works best and which areas of their workforce need attention. It is important for a company to understand just how its workforce strategies are panning out, which is why Kronos includes Workforce Analytics in its Central Suite. By analyzing all of its workforce data, a company can make both long-term decisions and short-term adjustments based on real-time information. Through easy analysis of workforce data in real time, businesses can make better staffing decisions. 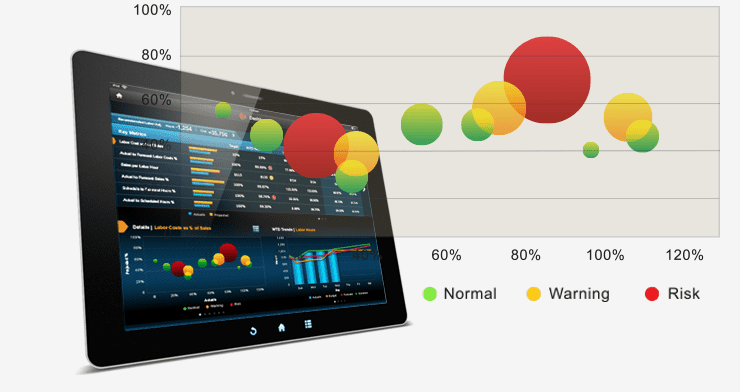 Whether a manager is using a computer in his or her office or a tablet on the sales floor, Kronos provides access to real-time analysis anywhere. And the reports are both insightful and utilitarian from charts meant to explore future steps to maximize profit to a dashboard with red, yellow, and green indicators that alert a retailer to workforce issues with scheduling, cost, overtime, and productivity. Kronos saves time and effort on both ends of the employee-employer spectrum by simplifying complicated, yet vital, tasks. Taking out that friction can lead to happier employees, more satisfied customers, and a business that can focus on growth and expansion. Despite the steady rise in e-commerce, brick-and-mortar stores remain crucial to the retail business model, but retailers need to adapt to seismic shifts in workforce trends. Employee engagement has become an important factor in the customer experience, and, to compete and expand, an employer needs to remove as many dissatisfiers as possible from its workforce management process. Kronos’ approach is particularly useful for retailers looking to reach an increasingly global consumer base. Retail is one of Kronos’ largest global markets, and its footprint has expanded into many countries due to demand. Kronos has made substantial investments in time and resources to ensure it understands the nuances of those markets so retailers aren’t tripped up by unforeseen compliance issues as they expand. Kronos seeks to stay ahead of any workforce issues that may arise for retailers — in the United States and beyond. For its ability to help retailers increase employment engagement and reduce friction points in the labor process, Kronos has earned our Editor’s Choice Award for Workforce Management Software.